Set 852 was released under the "Technical Set"series in 1977 in Europe. It made it to the US in 1978 with the number 954 as an "Expert Builder"set. 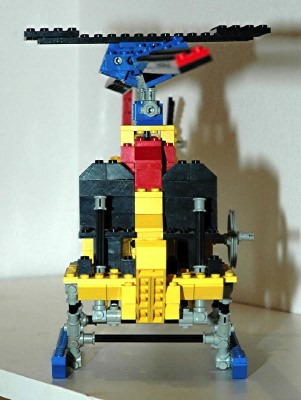 This helicopter features rotating main and tail rotors, and a collective pitch mechanism controlled at the pilot stations. Traditional studded construction is used throughout, with with a roughly equal amount of studless construction to accomplish the outer body shaping. 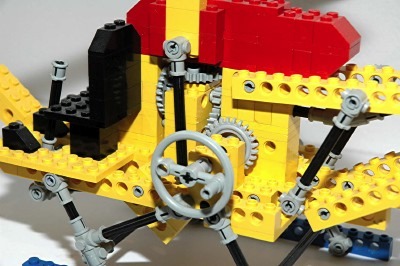 This was the only Technic set released by LEGO® in the first year which did not have wheels on the main model, and remains one of the very few such to this day. 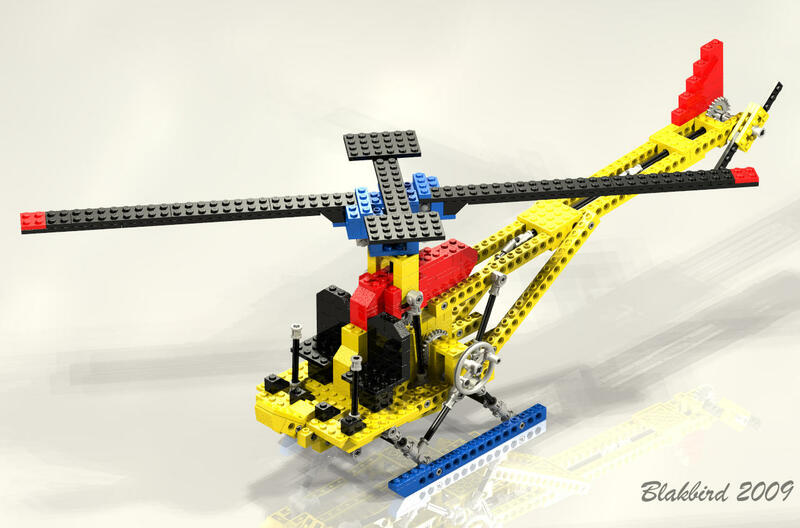 Helicopters have been a very popular Technic subject over the years, and a large number of them have been made. This first helicopter is still the only one to feature collective pitch and flybars with paddles. It also has the most realistic rotation speed ratio between the main and tail rotors. In these respects, it has never been improved upon. 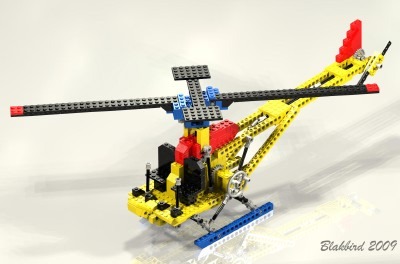 Some of the newer helicopters have more elaborate bodies and exteriors, but the simplicity of exterior design of real helicopters is one of the things which make them ideal Technic subjects. The rotors' rotation is driven by an input crank on the left side. This crank drives a set of 24 tooth gears. The gears on the level above (see computer image) are actually on two separate axles and rotate at different rates. The forward torque passes through a set of 8 and 24 tooth gears and then on to the main rotor, resulting in a 3:1 final gear ratio. The aft torque passes through a reversed set of 8 and 24 tooth gears which results in a gear ratio of 1:3 as the axle heads back to the tail. 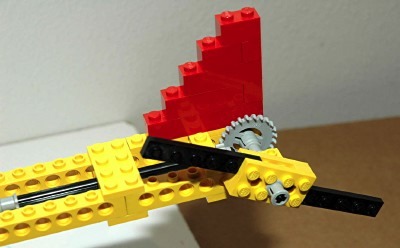 Two universal joints shift the plane of the axles, and finally the tail rotor passes though another set of 8 and 24 tooth gears which results in a final gear ratio at the tail of 1:1. Click for an animation of the rotor in motion. Rotation of the twin blade main rotor is controlled by the input crank as described above. The main rotor is pitched down about 30 degrees at neutral. 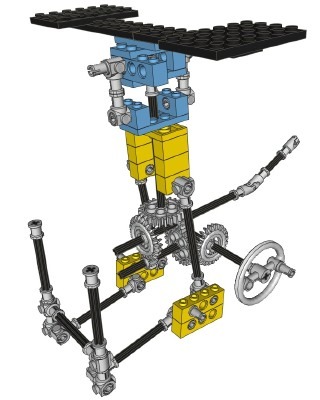 When the yellow drive block is translated upwards, the blue plate, acting somewhat like a swashplate, rises with it. 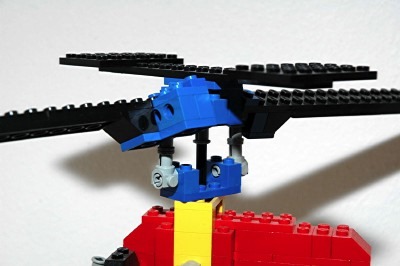 A pair of links are connected to the blue plate and force the rotor blades to reverse pitch (see animation). 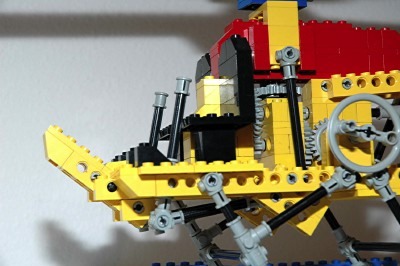 The main rotor head also features a pair of flybars and paddles, simulating a Bell-Hiller design. They are not functional. Ironically, it is these paddles which should really be driven by the collective, not the rotor blades themselves. The tail rotor is a simple twin blade, fixed pitch design. Both the main and tail rotors are constructed from standard plates. Click for an animation of the collective in motion. The pilot controls move only forward and aft, and are bussed together at the floor. Under the floor, they attach to a pair of links which connect to a crank made of beams. When these beams rotate (see animation) it pushes another pair of links up. These links are attached to a translating block which controls the pitch of the main rotor blades, as described above. There is no way to command the blades back to neutral. When the collective is moved back down, the yellow block moves away from the blue one, and the blue falls under its own weight. It sometimes sticks and will not return to neutral without some external force. The landing skids are constructed from beams, axles, connectors, and pins. The geometry is such that all links are always in compression so the connectors do not tend to separate.